Our Dental Implants Center in Manhattan only uses a top quality dental implants from Straumann, headquartered in Basel, Switzerland. It’s the largest and most advanced dental implant company in the world. Dr. Navid Rahmani is an internationally recognized, Board Certified Periodontist and top rated dental implant specialist. All dental implant treatments in NYC are performed by Dr. Rahmani in our Midtown Manhattan dental center. According to Americal Dental Association many failures and complications occur when using implants to support restorations. Most failures can be prevented with proper treatment planning. History of Periodontal Disease – Many studies report lower implant survival and success rates in individuals with a history of untreated periodontitis. Age and Gender – No evidence to suggest that age or gender affect the outcome of osseointegration in the short or the long term. Can Titanium Cause Any Side Effects in the Body? Titanium dental implants are specifically used because of its high biocompatibility with the body which makes any side effects very rare. It is extremely unlikely that you will experience any negative side effects as a result of having a titanium dental implant, but a very small percentage of people may have an allergy or sensitivity towards titanium or more likely one of the other metals used in titanium alloy. Side effects due to a titanium dental implant may manifest months or even years after the implant is inserted and can include swelling in the mouth, loss of taste or a tingling sensation. Mouth ulcers may develop or there could be purple or red patches on the palate. If an implant becomes corroded, it can release metal ions into the mouth. Frictional wear and tear on an implant can have the same effect. It is very hard to test for this allergy, but if you think you may have any sort of sensitivity towards titanium then this is something that will be discussed with Dr. Rahmani before you have implant surgery. If you are at all concerned about having titanium implants then it could be worth considering zirconia implants that are entirely metal free. What Are the Potential Risks of Having Dental Implants? Dental implant placement is a skilled procedure that does require extensive planning and experience to maximize the chances of treatment being a complete success and to minimize any risks. With any type of oral surgery there is always a small risk that something could go wrong but you can rest assured that Dr. Rahmani takes extensive precautions so any risks are minimal and the success rate of this treatment is very high. Nerves damage: There is the risk of damage to any nerves or blood vessels surrounding the dental implant if your implant dentist positions the dental implant too close to these structures. Numbness: This can cause numbness in your gums, chin or lips that may be temporary if the nerve is only slightly bruised or which could even be permanent. In this case the implant may need to be removed to get rid of the numbness and the area would have to be left to heal before it was possible to try to insert another dental implant. Risk of failure: It is also vital that the implant is inserted into a minimum amount of bone. It must be surrounded by several millimeters of healthy bone in order to become properly integrated. If the dental implant is poorly placed then there is a greater risk of failure as the implant may be unable to fully integrate and is more likely to loosen. While the actual implant procedure in NYC is relatively quick, extensive dental implant planning should have gone on behind the scenes. This is to ensure that the implant is correctly placed and helps make the procedure much smoother and more comfortable for patients. In order for a dental implant to be properly planned, it’s necessary for Dr. Rahmani to carry out extensive tests that include a cone beam CT scan. This provides a highly detailed 3-D image of the jaws and showing exactly where the sinus cavities, nerves and blood vessels are located so all these important structures can be avoided during implant surgery. At the same time, correctly placing the implant helps ensure that the final aesthetics are good. The implant has to be angled correctly and there must be sufficient room for the implant crown, bridge or denture to be properly made and fitted so it will look wonderful and is fully functional. Many general dentists now offer dental implant surgery but they may have undergone minimal training, possibly over just one or two weekends. Additionally, they might only place a few dental implants each year and will lack the skill and experience that is so important for ensuring treatment is successful and comfortable. AS A SPECIALIST, IF THERE ARE ANY ISSUES THAT ARISE AT TIME OF SURGERY OR DURING HEALING PERIOD, DR. RAHMANI IS TRAINED TO REALIZE IT AND ADDRESSED ACCORDINGLY. 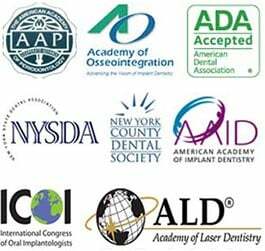 A dentist with only limited training in dental implants WILL REFER TO dental implant specialist in NYC WHEN THEY GET INTO TROUBLE OR ITS OVER THEIR HEAD. DR. RAHMANI SEES ALL HIS SURGERY PATIENTS AT MULTIPLE FOLLOW UP TO ENSURE THAT THE SURGICAL SITE IS HEALING UNEVENTFULLY AND ALL YOUR CONCERNS OR QUESTIONS AT DIFFERENT TIMES OF HEALING IS ANSWERED. A stent or surgical guide is another important part of planning an implant procedure. It is a template that is made using the 3-D image of your jaws, showing precisely where to place the implant during surgery. This high degree of precision is absolutely essential for treatment success but not every dentist bothers to provide a stent, or they may not have a cone beam CT scanner to produce 3-D images.